Today, many home and market gardeners are using beneficial insects to do their dirty work. The best way to embark on this wonderful relationship is with a little planning and preparation. Read on to learn more. Don’t send a boy to do man’s job, right? Same is true in the bug world. When you can, you want to select the right predators/parasites for the job. 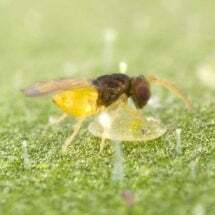 For example, the tiny trichogramma wasp, with a wingspan of approximately 1/50th of an inch, will attack and lay its eggs in more than 200 different species of moth and butterfly eggs. By doing so, it prevents garden-devouring caterpillars (larvae) from hatching and eating plant leaves. Sure, once a caterpillar hatches, a host of general feeders and parasites will go after it, but the trichogramma wasp is your first line of defense because it specifically targets the eggs. Reduce the number of caterpillars that hatch and you’ll avoid damage to your plants down the road (see Pest Control without Risks). In addition, by starting off early — before the caterpillars have emerged — other natural controls will have a better chance of keeping the rest of the pest population in check. 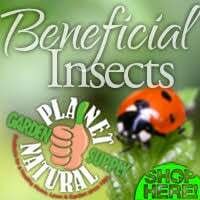 If you’re considering using beneficial insects to combat garden pests shop at Planet Natural. They guarantee live delivery of their shipments and offer a large selection so you can match the correct predator/ parasite to your pest problem. When using organic pest control, maintain an environment that nurtures and helps beneficial insects. For example, cover crops protect many predators and parasites (see Enticing Predators to Patrol Your Garden). Also, you will need to ensure that the insects that you are buying will survive, if not thrive, in your climate. Usually this is not a big problem, but it’s always wise to double-check the temperature and humidity needs for a given beneficial insect before you spend money on it. For example, some predatory mite species require a minimum relative humidity of 60%, while others do best at 40%. Choose the mite that will do best in your climate in addition to doing the best job against the pest you want to eradicate. Take care. Care starts with your supplier, but it should continue once you’ve bought your bugs. Insectaries that breed predators and parasites raise their insects in the environment best suited to them and then they ship them to people like you and me during the part of the insects’ life cycle when they are least vulnerable and most able to travel without ill effect. Once your “good bugs” arrive, provide them with a good home. For example, don’t leave a package of insects in a hot mailbox or in a freezing cold vehicle. Also, consider daytime temperatures when making releases – do not put beneficials out during the heat of the day. Think about how industrious (or hungry) you feel when working in the garden at high noon. It’s the same thing with your insects. They do better and are less apt to fly away when released during the cooler, more humid times of day. Provide for your predators/parasites and they will repay you well. Timing is often the trickiest part of biological control. If you’re releasing parasitic insects, a host or hosts must be available, otherwise the parasites will perish. 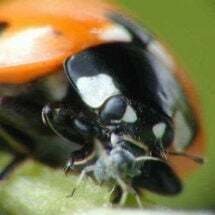 In some cases, regular releases are possible because a number of hosts will be available to allow the population of parasites to grow so that they’re in position of strength when common garden pests show up. When using a parasite that targets a pests specific life-cycle stage, you have to be sure to release the “good bug” when the pest is in that stage. If the predator only goes after the eggs and not the beetle then you shouldn’t wait until you have a large, mature beetle population before releasing the predator. For example, releasing trichogramma wasps after all the eggs have hatched into caterpillars will be of absolutely no help since trichogramma only parasitizes the eggs, not the caterpillars. The whitefly parasite, on the other hand, should not be introduced without the actual adult whitefly being present because it won’t have a “pest stage” to attack. For best results, begin releases when pest populations are low to medium. 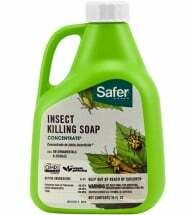 If pest levels are high, use a least-toxic, short-lived natural pesticide (insecticidal soap, natural insecticide) to establish control, then release beneficials to maintain control. While some predatory insects are able to survive periods without food, most need to eat constantly. 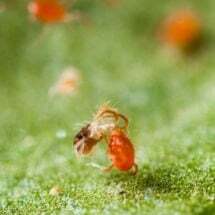 So, if the predator is specific — predatory mites, which only feed on pest mites — you must make releases when the pest is present but before their numbers get too large to achieve effective control. 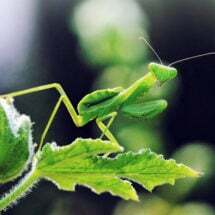 However, if the predator is a general feeder like a praying mantis, it can be released as long as some food is available. 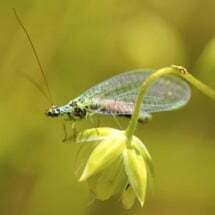 Releasing beneficial insects over time allows the predator population to grow. The larger the population, the more effective the pest control. Place an ample amount of insect predators and/or parasites, in good condition, as close as possible to the infested area. Proper application is, for the most part, just good planning and handling. Always take extra precautions when receiving the insects and maintain a good environment before they are released into your garden. Rate of application is also very important and varies from beneficial to beneficial. Instructions are available for all of the commercially available predators/parasites and should be provided with each shipment. Finally, do NOT wait until it’s too late. You can save money, time, and, plants by properly timing your releases. Follow these tips and you’ll be reaping the benefits of beneficials throughout the growing season.